A Gurgaon-based BPO employee, whose name is being withheld to protect his identity, had set his heart on buying his own home. He had arranged a housing loan, but knew he would be able to pay back the equated monthly instalments only if he got a substantial raise. It all depended on his annual appraisal, which he expected to be favourable. But as it happened the downturn intervened and his company decided - favourable appraisal or not - there would be no salary increments that year. The announcement led to a startling change in the employee. He began running through his savings, spending indiscriminately. He started spending an inordinate amount of time all alone walking up and down on the roof terrace of the house he lived in. His worried family finally sought professional help. Bipolar disorder can be of many kinds, but in its most severe form - also known as manic depression - it causes wild mood swings from extreme elation to complete despair, which can last for days to months. While experiencing a high, patients often become reckless, engaging in binge eating or spending sprees; they abound in confidence and seem to have little need for sleep. When the lows come on, all energy deserts them; they lose both their appetite and their self esteem, frequently contemplating, and sometimes committing, suicide. 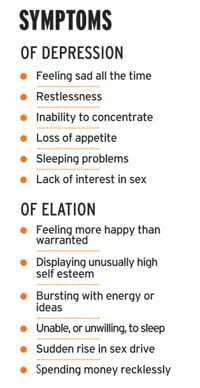 The precise causes of bipolar disorder are still not known - it often runs in the family - but stress is frequently a contributory factor. "The number of bipolar disorder patients has increased because of the highly stressed lifestyles people have these days," says Astha. "The treatment includes both medication and therapy." The way some people deal with stress also compounds the problem. "The professional environment is fiercely competitive," says Dr Monica Chib, psychiatrist at Indraprastha Apollo Hospitals. "Survival depends on one's coping skills. Some take to smoking or drinking to cope with stress, which may be even more harmful." Bipolar disorder can affect performance at work, and threaten both personal and professional relationships. "The family should appreciate that these are overworked people and give them support," says Dr Y.C. Janardhan Reddy, Professor at the National Institute of Mental Health and Neuro Sciences, Bangalore. Women are particularly prone. "The need for support is greater for working women who have both job and family related issues to cope with," Dr Reddy adds. Astha recalls a woman she treated who plunged into bipolar disorder after she lost both her parents. She was already having serious problems with her mother-in-law and was on the verge of a divorce. "A little bit of anxiety can even be productive," says Dr Reddy. "But only a little. If it incapacitates a person, it is a problem."